I’m a firm believer in probiotics for colon and overall health and immunity. Our western lifestyle of stress, processed foods and too much sugar–combined with use of antibiotics–all work to deplete the colon’s supply of good bacteria that keep pathogens away, help digest the foods we eat, and keep harmful levels of yeasts in check. 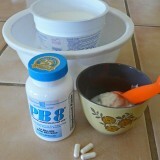 So I’m always shopping for the best deals and the best brands of probiotic supplements. Most probiotic supplements only have two types of bacteria: Lactobacillus acidophilus and Bifidobacterium. I figured the best brand will have the highest number of active bacteria and the greatest variety of bacteria. I finally found one that has ten different strains of friendly bacteria. It’s called PB8. And it was the spendiest of the probiotic supplements on the shelf. So I thought of a way to stretch my probiotics budget by multiplying the bacteria in yogurt. More specifically, in the culturing process of homemade yogurt. STEP 1 Heat a quart of milk in the microwave for five minutes. Use a glass container for the milk. STEP 2 Remove the scalded milk from the microwave and let cool to baby-warm. STEP 3 Heat a couple quarts of water in a large pot on the stove. Get it as hot as you can and still put your hand in it. Turn off heat. 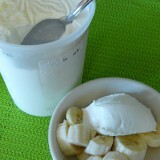 STEP 4 In a small cup, spoon a couple large soup spoons of plain yogurt (that you should have in the fridge leftover from the last time you made or bought yogurt) and break open two capsules of probiotic supplements into the yogurt. Mix well. Add a little of the lukewarm milk to the “starter” mix and stir. Add this mixture back into the warm milk and stir well until all the starter mix is mixed in with the quart of warm milk. STEP 5 Put your probiotic milk into a container and set inside the pot of hot water. Let it sit undisturbed for a couple hours. Do not stir the yogurt. Ever. STEP 6 Remove the yogurt container after a couple hours and reheat the water. Place the yogurt back into the hot water. The culturing process will take five to six hours (you may have to re-heat the water one more time). The culturing process grows all the good bacteria back into a new batch of yogurt, saving you the need to buy expensive probiotic supplements every month. A fun alternative to this recipe is to use half and half instead of milk and then use it as a treat instead of icecream. 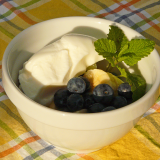 This is especially good for anyone who is lactose intolerant, as the cultures in yogurt eat the lactose in milk, making it a good way to get calcium if you lack the lactase enzyme (which is lactose intolerance). It’s also way better than frozen yogurt which does not contain live bacteria cultures. Olha, eu adorei esta sua receita, estou tomando acidophilus e esta sua receita me parece ser perfeita para a multiplicaçao dos lactobacilus, sem precisar gastar uma grana novamente na compra dos mesmo. vou testa-la imediatamente. onde q compra essa capisula???????????????? Eu comprei numa farmácia aqui nos Estados Unidos. No Brasil eu não sei. Tem algum leitor que sabe onde comprar capsula probiótico? Eu comprei na farmácia em São Paulo uma caixa com 10 sachês do probiótico Lacto Pro 4. Ele contém 4 cepas. Existe uma outra marca, muito mais cara, mas que contém também as mesmas cepas: Lactobacillus paracasei, Lactobacillus rhamnosus, Bifidobacterium lactis e Lactobacillus acidophilus. Gostaria de saber se o KEFIR é um iogurte probiótico. Bom, todo iogurte é probiótico porque tem lactobacillus, mas é melhor ter várias cepas. Parece que voce achou uma marca boa! Our server should be up late today or tomorrow so come visit us then at mryogurt.info – we keep it updated with the latest information and as far as we know contains the only comprehensive list of bacteriae used in yogurt.